 Serious, scholarly studies on dance in the Middle East are rare, and Middle Eastern dance traditions constitute one of the least analyzed and investigated aspects of dance scholarship. Perhaps no area of dance ethnography has been so routinely subject to romanticized, exoticized, and orientalist analysis and writing as Middle Eastern dance by admiring Western belly dance hobbyists. So sparsr are well-researched, analytical works in this field that frequently the standards imposed on its authors are dramatically less demanding that in other areas of current dance scholarship. Shay, Anthony. Rev. 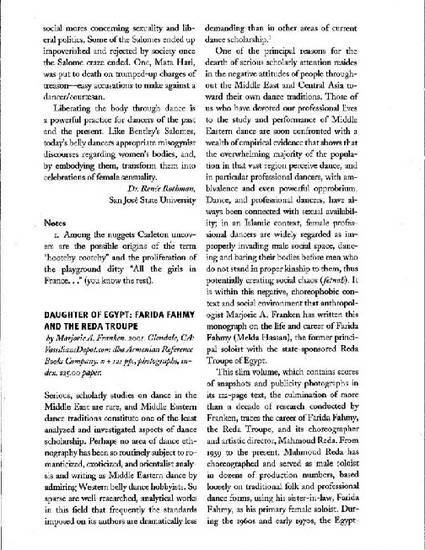 of “Daughter of Egypt: Farida Fahmy and the Reda Troupe,” by Marjorie A. Franken. Dance Research Journal 35, no. 1 (Summer, 2003), pp. 111.114.